Welcome to the first day of Chocolate and Costa Rica Theme Week. Today's Upala Costa Rica 70% Dark + Nibs bar was made by Potomac Chocolate (Woodbridge, VA). This Upala 70% bar with nibs was made from cacao grown on Finca La Amistad, a small farm in northern Costa Rica. 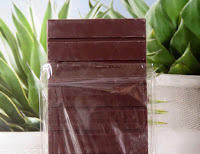 The two-ingredient bar (organic cacao and organic sugar) had a pleasing rich, dark aroma with a hint of dried fruit; and deep, true chocolate and red fruit (dark cherry, plum) flavor notes. 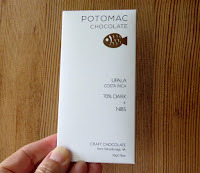 The cacao nibs added a slight earthiness and crunchy texture. 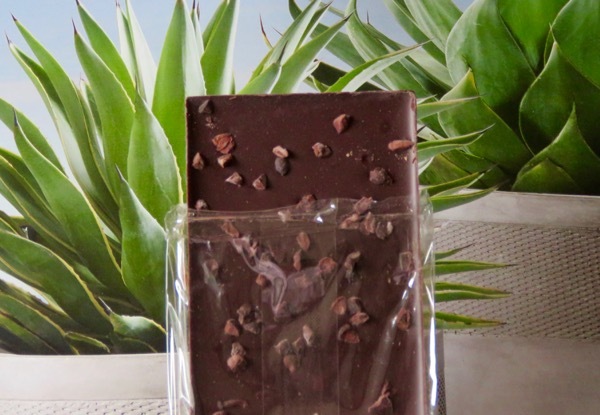 The maker's description of this bar (Batch 11610) read: "Rich and earthy with notes of chocolate, caramel, nut and red fruit." *We're not counting chocolate that was made from scratch in colonial days (e.g. in Williamsburg, VA), because much of that chocolate was in beverage or rougher, confection-like form.